Today’s newsflash is that you can’t believe every health claim you read on a pill bottle, which is one of the reasons I think it’s smart to count on food for your vitamins instead. And although nutritional science waffles on what’s good and bad for us, I think we can agree that it’s always nice to see presumably-health-promoting-and-also-delicious foods smiling up at us from our plates. Probiotics are a current darling of the health-food scene, which pleases me because I always like when my favorite foods come into vogue (hello, dark chocolate!). Sandor Katz emboldened me to ferment my first batch of sauerkraut two years ago, and since then, in the secret world of off-blog cooking, I’ve continued the science experiments of fermentation in bubbling jars in the fridge and basement. 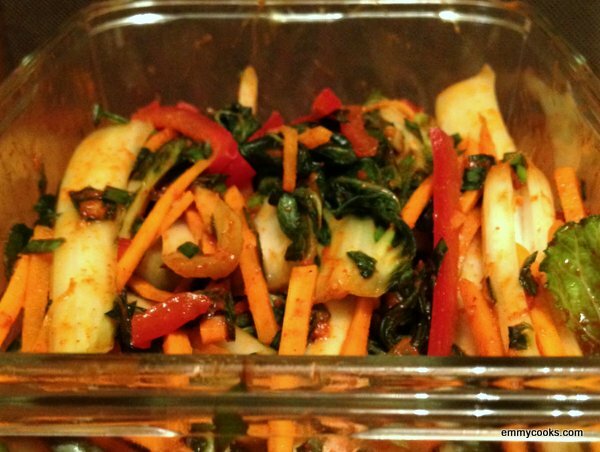 Sauerkraut has been my mainstay, but I’ve dabbled in other vegetables (do you have favorites?) including the Oxbow Farm carrots I met at IFBC last year and way-too-green tomatoes. But this week I’m off the hook, heading into uncharted territory. I followed a friend’s advice to a Korean grocery emporium north of Seattle yesterday, came home laden with potential kimchi ingredients, and scooped The Kimchi Cookbook from my shelf. I salted and chopped and stirred and gooped things together with my hands until I had jars stuffed with three gorgeous varieties of straight-from-my CSA kimchi: napa cabbage, chive, and this joi choi (a variety of bok choi) number. This last one is a quickie summer kimchi to make today and eat tomorrow, so I can already tell you that I will be making more: it’s tangy and hot and ready to star in tomorrow night’s kimchi fried rice. I see a new future for the odds and ends from this summer’s CSA box, friends. 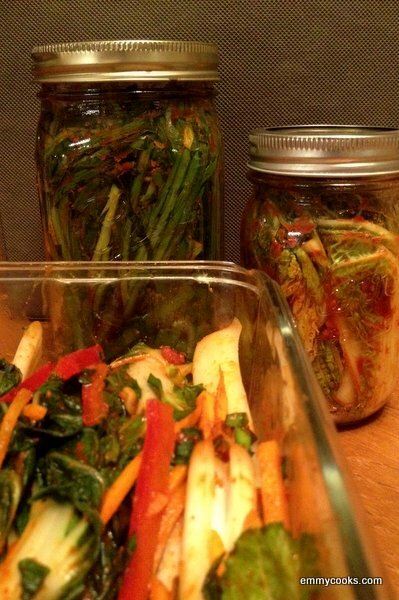 Joi Choi Kimchi (adapted from The Kimchi Cookbook): Wash a pound of joi choi and cut the stems and leaves into 4″ lengths. Dissolve 2 Tbsp. kosher salt in 4 c. water and soak the joi choi in the brine for 45 minutes, then rinse and dry. Meanwhile make a paste of 1.5 Tbsp. Korean chile pepper flakes, 1 Tbsp. Korean fish sauce, 1 tsp. sugar, 1 tsp. minced garlic, and 1/2 tsp. finely grated ginger. (Smells amazing already, right?) Julienne 1/4 c. each green onion, carrot, and red bell pepper, then mix all the vegetables with the chile paste in a big bowl, using your hands to evenly distribute everything evenly. Pack into an airtight container and leave at room temperature for a day, then eat or refrigerate for another day or two before serving. Hello Emmy, this looks lovely and I”ll want to try this at some point…but I was wondering: why only Kosher salt? Cannot the large grains of sea salt do? Thank you! It’s so nice to see you post again. I use your take on recipes quite often and they are always so delicious! very definitely making this tomorrow! only waiting until then because it’s too dark out to pick vegetables…. Wait? Who is this I see in my WordPress reader? Glad to see you! Mmmmm, kimchi. Emmy! This looks great. It’s been a while since I made kimchi and I think that I stopped because I had a jar burp/explode in the fridge. I think I did something wrong… but this is good inspiration to try it again! Thanks and so glad to see you!!!!!!! Quick kimchi! Too good. I may make this very, very soon. Cheers Emmy!!!!!!!!!!! !